Click this image to download Home Staging eBook. 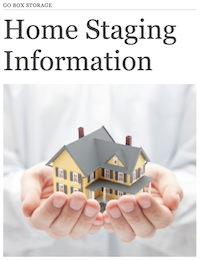 Over the last few months, GO BOX Storage has been researching and updating our home staging information. Home Staging is used to help sell your home quickly and at the best price possible. During difficult economic periods good home staging can really make a difference between selling or not selling your home. We are really happy to offer you our new Home Staging ebook. The ebook was created by Morgan Smith who did a great job of explaining the finer details of successful home staging using an easy-to-follow point form system. This 20 page ebook is full of good advice to get you into the right frame-of-mind to sell your home. There is a whole page on helpful links if you are looking for more information or support for your home staging activities. Updated April, 2015: If you are looking for professional help with home staging, Joy Wile with Visual Expressionz can help. She also does interior decorating and design.